Who’s ready for the Memorial Day cook-outs? Now that I’ve made a batch of these bread and butter pickles, I’m all set. 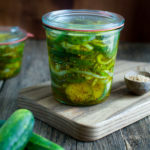 I know that pickles aren’t necessarily the star of a cook-out but they are one of those important supporting characters that can make a good hamburger/BBQ sandwich/hot dog into a great one. I like the slightly sweet and tangy taste of bread and butter pickles more than the straight up sourness of a dill pickle but good bread and butter pickles can be hard to find. There has to be the right ratio of sugar to spices to vinegar. I guess I’m picky about my bread and butter pickles after the many jars of amazing homemade pickles my husband’s aunt used to give us. Fortunately, she also gave us her recipe so I don’t have to go without. The original recipe is geared for canning a couple of gallons of pickles which is more than I ever want to take on. So, I adjusted the quantities to something I can manage. Since I’m not an experienced canner, this recipe is for making pickles to be stored in the refrigerator for a few weeks rather than being shelf stable for a few months. I enjoy snacking on these pickles so the shorter storage time isn’t a problem for me. Besides the right balance of sweet and spicy, a good pickle has to be crunchy. It’s important to not overcook the pickles once you add the cucumbers to the pickling brine or the pickles will lose all their crispness. The brine should be hot but not boiling. Then just barely cook the pickles for a couple of minutes. They will continue to cook once you remove them from the heat and transfer them to jars. My sisters are coming to visit for Memorial Day and you can bet these bread and butter pickles will make an appearance at any cook-outs we have. Thoroughly wash the cucumbers to remove any dirt. Slice the cucumbers into 1/4 inch thick slices, discarding the ends. In a large glass or ceramic bowl, make a single layer of cucumbers, top with a layer of onions and bell peppers. Generously sprinkle with kosher salt. Top with a layer of ice. Repeat layers with remaining cucumbers, onions, peppers, salt, and ice. Let mixture sit at room temperature for 3 hours. Drain the cucumber mixture in a colander, rinsing lightly to remove excess salt and discarding any unmelted pieces of ice. In a large saucepan (big enough to fit all the cucumbers), mix together the cider vinegar, sugar, turmeric, mustard seed, and celery seed. Bring to a boil, stirring until sugar is dissolved. Carefully add the drained cucumber mixture. Reduce the heat so the mixture stays hot but is not boiling. Cook for 2 minutes, stirring until thoroughly mixed. Remove pickles from heat. Ladle pickles into airtight jars and store in the refrigerator for 3 weeks. Let pickles sit for at least 24 hours before eating to allow flavors to fully develop. I fill up 2 (18 ounce) Weck jars and 1 (10 ounce) Weck jar with this recipe.